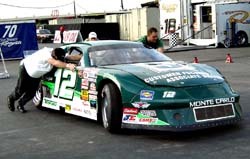 Last season, Greg Pursley competed regularly at Irwindale Speedway and did a pretty good job of it. 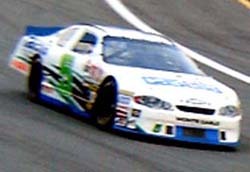 He won the track championship and collected enough points to also capture the NASCAR Dodge Weekly Racing Series national title. So when he rocketed from third on the grid to the lead in the first two corners of the first lap in the first Elite Division qualifying race, people were impressed, but not surprised. Pursley continued to lead all but one of the remaining laps. Unfortunately for him, the one that he didn’t lead was the one the mattered the most. Nick Lynch beat him to the finish line on the 50th lap by .003 of a second in a finish that took several minutes to sort out. 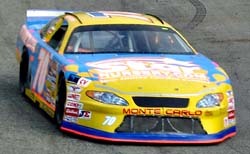 Lynch led a sweep of the top three positions by Southwest Series competitors. Pursley was second and M.K. Kanke was right in their tires tracks finishing third. Also in the four-car breakaway pack at the finish was Southeast Series driver J.R. Norris. The second of the two Elite Division races was also dominated by the NASCAR Southwest Series. The top four finishers were Rip Mihaels, Thomas Martin, Burney Lamar and Augie Vidovich. This capped off a pretty long couple of days for the series regulars. 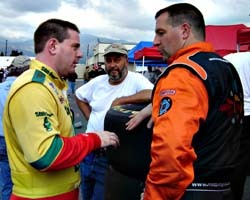 They raced at Phoenix International Raceway on Thursday, headed up the road and were at Irwindale as the work day began. Losing a day of practice didn’t hurt much as proven by their dominance. And getting here might have been half the fun. The best and brightest of the Busch North guys in this race was rookie Sean Caisse, who took the lead on lap three and survived a wild late race restart to take the final checkered flag of the night. But listening to Michels, there should be another good race on Saturday when the Elite division hits the track. He predicts that on the first lap, guys will be running three or four wide entering the corners. Michaels also predicts that experience will win out over youthful enthusiasm in the main event on Saturday. After the dust had settled for the Elite division teams, the Grand National teams took to the track. Like the Southwest Series before them, they dominated this 50 lapper. They also kicked up some dust of their own as well. While battling for third with two laps to go, Dale Shaw and Mike Stefanik got together and went for a synchronized spin in turn two. West Series driver Mike Duncan got caught up as well. This set up a green, white, checkered finish. Joey McCarthy had led most of the way and at one point had a lead of more than a zip code over his competition. The final caution didn’t help his cause though. Mike Olsen started right outside of him and that led to a two-lap drag race to the finish. Olsen got a leg on his competition at the line and took the victory. McRae in over a dozen seasons of competition on the tour. “Barney’s really happy,” said Caisse. Both driver and owner could even be happier tomorrow night around the same time. With 13 laps to go, Mike Johnson and Matt Kobyluck kept Caisse honest and ran three-wide for the lead for one lap. But it didn’t take long for Caisse to motor ahead of the duo and go to the front again. Strangely enough, Caisse was longing for another late race caution, one that never came. The #12 team of Rip Michels unloads their car after racing to Irwindale. Mike Olsen (L) talks with his fellow New Englander, Matt Kobyluck (R).